I'm here on Patreon in an effort to attract fans and sponsors who would enable me to make more videos about aviation. This might be about GA (General Aviation) and all its many interesting forms, business or commercial aviation, or unmanned aviation (drones etc.). I'm also keen to create videos about aerospace and space flight. I have experience of both general and unmanned aviation as I gained a Private Pilots Licence for fixed wing aircraft and I also gained PfAW (Permission for Aerial Work) from the CAA (Civil Aviation Authority) which enabled me to fly drones commercially. I'm now concentrating on promoting aviation through the medium of video. I would be very glad to hear from anyone who would be willing to support my efforts to produce videos that will inspire and motivate another generation of aviators of all ages and aspirations. This link will take you to a blog post which tells the story of my discovery of flight from my first ride in a powered aircraft right up to obtaining Private Pilots Licence. 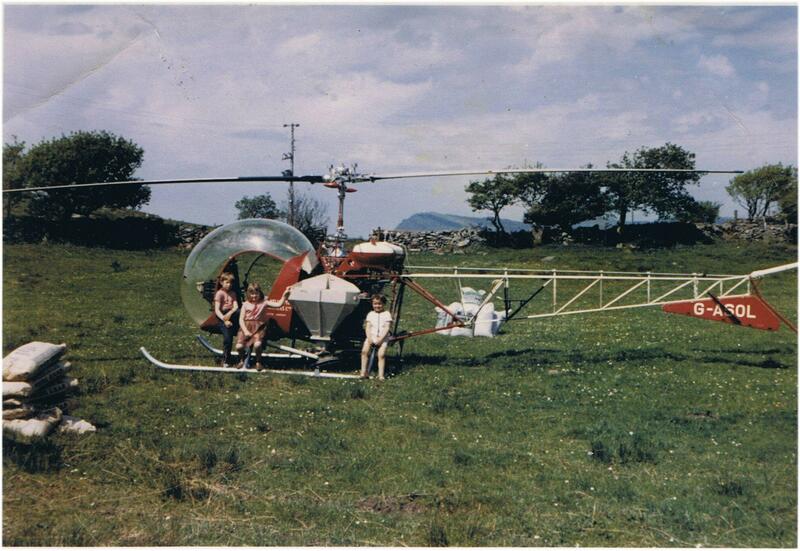 It was the ride in the helicopter pictured below during the 1960s that inspired a lifelong love of aviation for me (that's me, on the right). I'd like to inspire others to learn to fly, whether their ultimate aim is for recreation, a career in commercial aviation, or to eventually reach for the stars as the pilot of the new generation of spacecraft that will be leaving the Earth's atmosphere in the decades to come. Your sponsorship will help to pay for stock images and videos that will be used to illustrate the videos. The stock is purchased from reputable suppliers who ensure that the photographers and videographers receive their well deserved fees for the professionally quality work that they produce. Every 12 months I'll make you a bespoke YouTube video using images and video clips that will promote you, your business, your services, or your products. You can use this throughout the year on your website, blog, and in social media. I will also promote it through my social media accounts throughout the year. Twice a year I'll make you a bespoke YouTube video using images and video clips that will promote you, your business, your services, or your products. You can use this throughout the year on your website, blog, and in social media. I will also promote it through my social media accounts throughout the year. In addition, twice a year I'll also make you a 15-30 second video to use on social media. Every month I'll make you a bespoke YouTube video using images and video clips that will promote you, your business, your services, or your products. You can use this throughout the year on your website, blog, and in social media. I will also promote it through my social media accounts throughout the year. Twice a month I'll make you a bespoke YouTube video using images and video clips that will promote you, your business, your services, or your products. You can use this throughout the year on your website, blog, and in social media. I will also promote it through my social media accounts throughout the year. In addition I will make two 15-30 second videos per month. Alternatively, we can discuss other options that may be more suitable for you. When I reach $400 per month I'll create regular monthly videos covering a roundup of news about flight training and best practices for both manned and unmanned aviation.